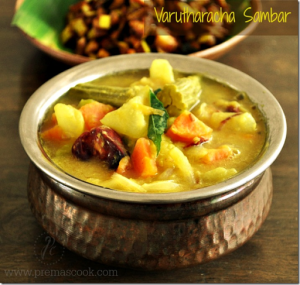 Sambhar/Sambar is a very well known recipe in the southern parts of India.Varutharacha Sambar is one of kerala recipe that I learnt from my Friend and this sambhar prepartion is slightly different from Arachivitta sambar which i usually makes .I have prepared it last year at my friend’s place for onam.This post slept in my draft almost a year and now am sharing this.May you guys try for Vishu. Heat the coconut oil in a kadai and dry roast the roast and grind ingredients and powder it in mixie. Pressure cook the toor dal with enough water and keep aside. Mean while wash and cut the vegetables,keep it ready. In Vessel add the cooked dal with the water and the veggies – Pumpkin, winter melon, carrot and tomato,drum stick.Let it cook well,till the veggie become soft. Now add the turmeric powder, enough water and salt.Then add in tamarind extract. Bring to a boil. Add the grounded powder and mix well.Let the sambar boil well, till the raw smell goes. Adding coconut while grounding is optional. Roasting in coconut oil gives nice flavour so don’t skip it. 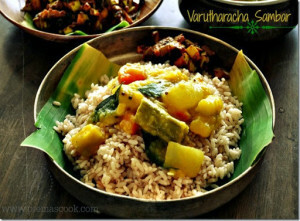 Technorati Tags: Kerala Dishes,Sadhya,Sadya Recipes,Vegetarian,Kerala,Sadya Vibhavangal,Trissur Recipes,Sambar,Sambhar Recipes,Vishu 2014,Vishu Recipes,Vishu. 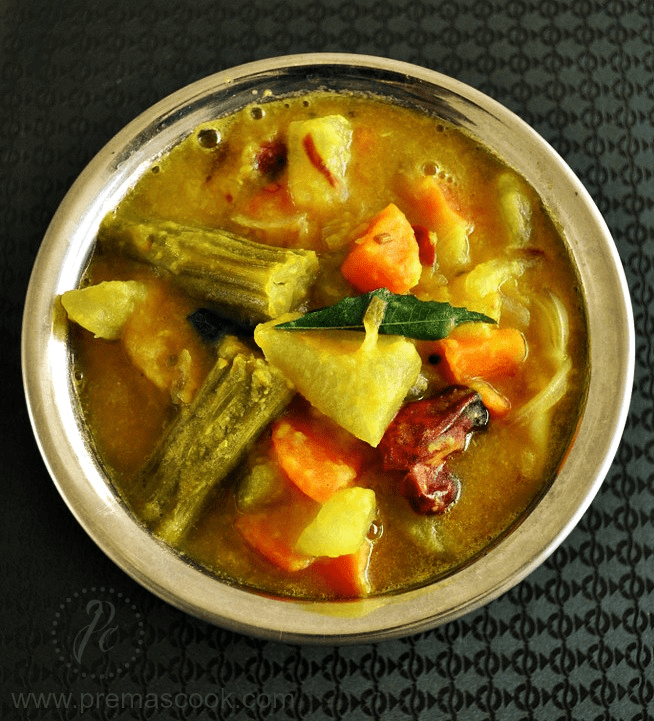 very healthy sambar, with lots of veggie. Looks really delicious. Oh yum it looks …love the last pic …spread in leaf …hungry! Such a fingerlicking sambar, hard to resist..